Here is a selection of what some of our current and active customers say about us, the service we provide and quality of support that they receive. PLEASE LEAVE US A REVIEW ON TRUSTATRADER! 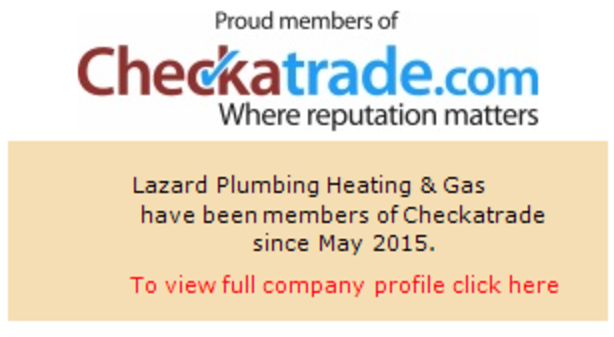 PLEASE LEAVE US A REVIEW ON CHECKATRADE! Renewed blocked pipe in Central heating system. Combi boiler repair due to weather killing my boiler. Frozen pipe / split water pipe. Boiler serviced and gas certified in rental property. Repair boiler - fault F 61. Unscrewing of two very difficult to remove taps. Tightening of tap fixture to draining board. “The service includes Text updates, so I knew who was arriving and at what time. The quote given was all inclusive and I was able to arrange a date that was around my schedule. I was also able to pay by bank transfer after the work was completed. The plumber arrived, even wore shoe bags to keep my floor clean and kept everything tidy. We even demo tested the new unit. The work was very high standard. I'm sure I would use if needed in the future. Old sink unit removed and replaced with one they supplied. One new radiator plus a power flush of all central heating radiators. Fitted new kitchen taps and amended feed to the taps. Repaired shower replacing faulty part. Installation of shower pump and pipe work, fitting of new shower head. Trace leak, replace kitchen mixer tap. Replacement of leaking drainage pipes. Yearly boiler check plus living room gas fire. Installation of new gas hob. New Vaillant Flue and pipe work. New bathroom fitted, underfloor heating. New boiler fitted, new electric shower, power flush, 2 new radiators, several new radiator valves and installation of NEST. New basin, vanity unit and toilet fitted. Old shower taken out and new fitted. Toilet not flushing and leaking.